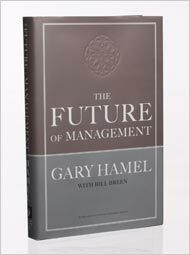 …Hamel argues that organizations need bold management innovation now more than ever. The current management model – centered on control and efficiency – no longer suffices in a world where adaptability and creativity drive business success. The Whole Foods Market company is detailed as an example where management innovation drove great success through development of a community purpose among all stores and employees. This was done through setting and holding new bold principles and standard, high level of employee accountability and incentives, and by getting rid of any preconceived or expected management techniques to allow new ideas to develop without criticism. The next example is about W.L.Gore and its vision that brought about a $2.1 Billion company creating the well known Gore-Tex among many other products in 45 plants around the world. Gore flattened the organization eliminated the need for approvals and allocated 10% of all staff time to be used for creating new things and acting on new ideas. Next, the shackles of old management principles are discussed and how to break free from these old ways. Embracing new principles by using diversity, democracy, flexibility, and meaning with all employees are the keys here. Also, the techniques to learn new ways are outlined which include democracies of ideas, amplifying imagination, implementing new learning methods, using collaborative involvement, asking for volunteers and by leveraging the wisdom of crowds. All of these techniques look very much like the Web 2.0 revolution and the same advantages that the internet is experiencing from massive per person involvement is possible at a management level if some of the boundaries are removed and the environments are worked to let them expand and be creative. I personally love this style of management and got a lot of new idea son how to further involve my team and produce an environment to stimulate imagination, collaboration and ultimately drive more and more innovation. I definitely recommend this book to any manager or leader. It is especially useful in a technology based company where many of the concepts are visible in the technology and products being produced but has not yet transitioned into the day to day culture of the workplace and management team. Interesting book – thanks for sharing! I love your book reviews Mike – saves me from reading the whole thing! When you get around to it, one business-type book that I’d like you to review is “Integrity” by Henry Cloud. I’ve got a copy you can borrow! I’ve quite a stack right now but that is definitely one I’m interested in. So many great books to read!!! A manager that can incorporate those points above will definitely be successful in developing and moving forward the business. Since people are the company’s main asset, the future of management has to change to stay competitive and meet the demands of future business.